SCI (Surgical Centre of India ) International Hospital is a multispecialty hospital with state of art infrastructure, latest technology and a dedicated team of experts and support staff. This renowned hospital has a capacity of 80 beds with high-tech maternity Operation Theaters, 10 bedded well equipped Intensive Care Unit (ICU) and 15 bedded Neonatal Intensive Care Unit (NICU). The hospital offers a wide variety of beds and room, such as sharing, Single Private, Executive, Super Deluxe and Twin Room Suite, suiting to the need and requirements of the multitude of patients. Modular OT Complex equipped with advanced surgical instruments, dedicated Implant OT and Lithotripsy Suite. Well set-up Imaging and Diagnostic Division with high-frequency radiography, x-ray machine with CR system, ultrasonography, echo & color Doppler, high-end urology diagnostics (Urodynamics Lab, Uroflowmetry). Department Obstetrics & Gynaecology has Birthing suites equipped with latest technologies such as superior quality stryker (USA) Labor delivery beds, CTG, Multipara Modular Monitor and Neonatal Resuscitation. Mother and Child Care Center has splendid Labor-delivery-recovery suite with direct access to Level III Neonatal Intensive Care Unit (NICU) containg GE Giraffe Incubators for neonates. 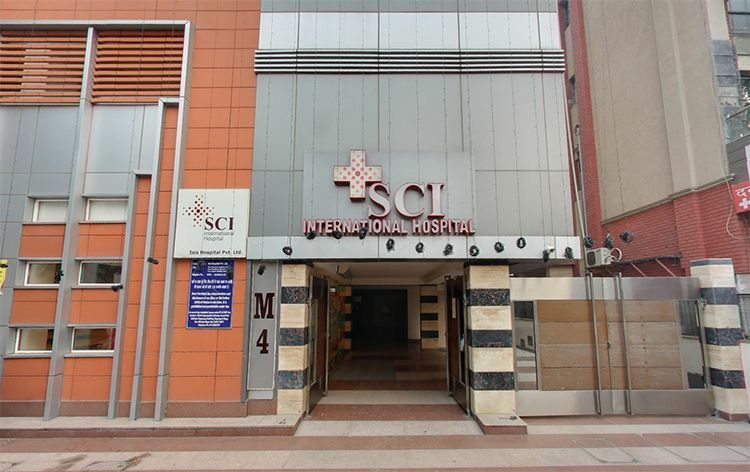 SCI International Hospital is a leading medical facility which believes in providing the best medical care to all the patients, from India and abroad. Thousands of international patients choose to get treatment at SCI based on the excellent quality of clinical care and healthcare service delivered by highly trained and dedicated doctors and medical staff. This hospital, known for being one of the best in the field of Obstetrics & Gynecology and IVF treatment, holds the reputation of delivering more than 2500 babies from more than 55 countries. Nearest Airport: Indra Gandhi International Airport which is around 15.8 Km away from the hospital and it takes about 49 min drive to reach the hospital. Nearest Railway Station: New Delhi Railway Station which is around 13.5 Km away from the hospital and it takes about 34 min to reach the hospital. Nearest Metro Station: Kailash Colony Metro Station which is around 2.1 Km away from the hospital and it takes about 5 min to reach the hospital. SCI International Hospital performs 242 different procedures. Click on a procedure name to see more details and to view doctors for that specialty. 4 average based on 51 reviews.